For Ford India, the Ecosport with 91,566 units was the export best-seller while the Verna with 40,279 units was Hyundai Motor India's best export performer. Despite being the export leader for the second straight year, the numbers for Ford India, which shipped a total of 162,801 units overseas in FY2019, compared to Hyundai Motor India’s 162,105 (+5.30%) are down a sizeable 11.33 percent. What helped tilt the balance in Ford’s favour is its despatches of 19,069 units in March 2019 (+2.72%) compared to Hyundai’s 16,800 units (34.42%). Clearly, even the last burst of exports from the Korean carmaker in March 2019 was not enough to win it back the export leader crown. Ford India’s exports are fuelled majorly by its Ka / Ka+ hatchbacks, Aspire sedan (made in the Chennai plant) and the popular global best-seller, the EcoSport compact crossover (made at the Sanand plant), all going to over 50 countries across Europe, Middle-East, Sub-Saharan Africa, Asia, and to emerging markets in North America as well as in Australia . The updated EcoSport has been its best-seller with 91,546 units exported (FY2018: 90,599), albeit marking tepid growth of 1.04 percent. Importantly, it is the mainstay of Ford India’s exports, accountinf for 56 percent of total PV exports in FY2019. For Hyundai Motor India, the new Verna has been a strong driver for its exports. In FY2019, a total of 40,279 Vernas were despatched abroad, compared to 14,769 units in FY2018, a massive 172 percent YoY increase and accounting for 25 percent of total exports. Demand for the Creta SUV, the No. UV in the domestic market, however has fallen sharply in the export market. FY2019 saw total sales of 37,308 units, down 26.58 percent (FY2018: 50,820). 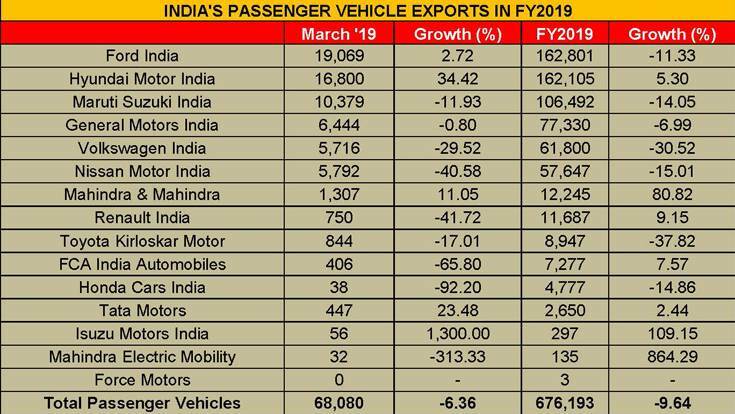 Likewise, Eon hatchback’s export fell from 6,813 units in FY2018 to 1,950 units in FY2019. Meanwhile the Grand i10, Elite i10 and Xcent together sold 82,568 units (FY2018: 81,540), their demand up marginally. As it did in FY2018, Maruti Suzuki India, which has its full focus on the domestic market, took the third spot in the PV exports market, shipping out a total of 106,492 units, down a substantial 14.05 percent (FY2018: 126,074). The Alto and old Wagon R hatchbacks accounted for 17,722 units (FY2018: 16,818), the trio of new Wagon R, Swift and Celerio for 17,722 units (FY2018: 16,818), and the premium Ciaz sedan for 2,313 units (FY2018: 2,017). Demand for its UVs (Gypsy, Ertiga, S-Cross, Vitara Brezza) grew to 5,724 units from the 5,463 units in FY2018. GM India, which remains solely an export player with manufacturing from the Talegaon plant, exported a total of 77,330 Beat hatchbacks, down 6.99 percent YoY. What led to this negative growth is the slowing demand for the Beat hatchback which is exported to Latin American countries. At 77,330 units, the Beat exports are down 7 percent YoY. At No. 5 is Volkswagen India, which exported a total of 61,800 cars but down 30.52 percent YoY. Its trio of the Polo, Polo GTI and Ameo sold 10,060 units, down 24 percent. The Vento and Ameo, the company’s mainstays in the export market, too saw demand dip to 51,740 units, down 31 percent (FY2018: 75,571). Nissan Motor India, once a strong exporter, continues to struggle for growth and is at No. 6 in the PV Exporters List. At 57,647 units in FY2019, its numbers are down 15 percent YoY. The trio of the Micro, Datsun Redigo and Go which sold 31,877 units in FY2018, saw export demand slide 54 percent. The Sunny sedan however continues to maintain its growth with sales of 2,313 units (FY2018: 2,017). Its UVs comprising the Evalia, Go+, Terrano and Kicks saw total exports of 2,087 units, up 11 percent. Mahindra & Mahindra shipped a total of 12,245 units, notching growth of 80 percent albeit on a low year-ago base. This included 6,423 units (Bolero, ST, Quanto, Thar, TUV300, KUV100, NuvoSport, XUV300), 16 Vibes, 4,070 (Scorpio, Xylo, HT, Bolero Plus, Xuv500, TUV300 Plus, Marazzo) and 1,478 (Maxximo Minivan VX, Supro). Toyota Kirloskar Motor has had a tough year in exports. The Bangalore-based manufacturer exported 8,947 units, down 37.82 percent YoY. Overseas demand for its Liva hatcback dropped by 44 percent to 5,634 units (FY2018: 10,082). Likewise, the Etios sedan with sales of 3,238 units was down by 21 percent YoY (FY2018: 4,115). While 11 Innovas were exported, a total of 64 Fortuners went abroad. Honda Cars India despatched a total of 4,777 units, down 14.86 percent. These included trio of the Jazz/Brio/Amaze with 2,317 units (FY2018: 2,769), 846 City sedans (FY2018: 1,005) 92 UVs (Mobilio/ WR-V) and 1,506 WR-Vs.
Tata Motors, which is having a great run in the domestic market, exported a total of 2,650 units, up 2.44 percent YoY. In the overall PV export scenario, FY2019 has been a forgettable year but it's also been one beset with a whole lot of challenges for the automotive industry. The domestic market too saw tepid growth with overall industry sales of 26,267,783 units (+4.86%) with the PV market contributing 3,377,436 units (+2.70%). What aggravated the situation further in FY2019, according to apex body SIAM, has been the challenging environment of tough trade barriers, as well as country policies favouring CKD assembly over CBU imports.